Michelle sees the renewal notice and makes a mental note to renew as soon as she can. She thinks back to right after she joined. The association offered a webinar on the very problem she had been struggling with; it was like they read her mind. She made time for the webinar and was grateful she did. The presenter was knowledgeable, and the content was super helpful. After that webinar, she started making a point of reading the weekly newsletter which gave her the added benefit of knowing when events like the conference were coming up. Michelle attended the meeting and felt right at home. Of course, she will join again, she thinks. The phone rings and Michelle is drawn back into the frantic pace of her work. A few weeks later another renewal notice pops up. Michelle decides to renew right then and there before she forgets again. She pulls out the corporate credit card with a smile thinking about how glad she is she found this association! These are the two most common stories new members share of the renewal experience. Members who received little or no value are repelled by the barrage of renewal reminders. Members who received value and had a good experience with the association perceive the renewal notices as helpful reminders. More important, members say their level of engagement is linked with their early experiences as a member. Members who derive value from the association and then engage with the organization are more likely to be engaged members the life of their membership. This e-book is a compilation of the overarching insights from over 330 in-depth interviews with both engaged and unengaged members. While these members come from very diverse backgrounds and experiences they agree on what associations do that provide them the most value and exceptional experiences and members agree on why they engage and ultimately renew. How to engage members early to engage them for life. Why members describe the decision upside down from the way, we think of it. What the new member engagement equation is. The report is 4.3 MB and may take a few seconds to download. If you would like to have me come to your conference to speak about the insights in this e-book learn more and contact me for availability and more information. 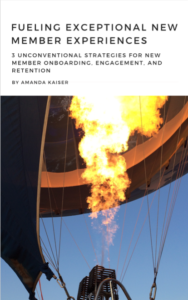 If you like this e-book be sure to sign up for the weekly blog for more ideas, member insights, and trends, in member onboarding, engagement, experience, and retention. I’ve been calling your e-book my “membership bible”.